While participants in the Verizon Innovative Learning (VIL) program summer academy had the opportunity for hands-on learning in the past few weeks, this week they heard from members of Verizon. 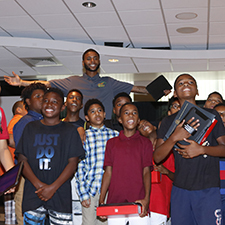 Launched in 2015, the Verizon Innovative Learning program works with Historically Black Colleges and Universities (HBCUs) and Hispanic Serving Institutions (HCIs) to prepare minority male students in middle school for the tech careers of the future. Students first heard from John Granby, market leader for Verizon’s Great Lakes market. “I think what you are doing (participating in VIL) is amazing and will set you the path to be successful,” Granby said to the students. Granby said technology continues to evolve at a rapid pace and it will be critical for students to understand the role they can play in shaping technology. Granby also told the students to become a strong candidate in the job market by advancing in their education. A few days later, during the closing ceremony, students also heard from Ivan Berg. Berg is the area vice president in global wholesale operations at Verizon. “You’re part of something bigger, something special,” Berg said, noting that only 1,800 students nationwide were able to participate in the VIL program. Berg commended the students for putting in the time and effort the program requires rather than opting to spend their free time at home or doing something less rigorous. “You’re here because you’re trying to make something better of yourselves,” Berg said. Berg talked about how working in STEM fields is about looking at something and seeing the possibilities of it. For instance, he said, operating a drone was part of the VIL summer academy curriculum. While most people might think of a drone as a toy, he said, Verizon is researching ways for drones to impact daily life. Drones can be outfitted with infrared cameras, he said, to help firefighters fly over burning buildings to determine the hottest spots or if someone is still inside the building. In Australia, Berg said, life guards deployed a drone over someone drifting out to sea to drop an inflatable raft. Students celebrated the closing of the summer academy with their parents. Giveaways and certificates were awarded as part of the ceremony.